Bootshaus @Neckarufer (Heidelberg, Germany) | Get Your Grub On! After my Germany trip had kicked off with the beautiful wedding of my beautiful sister I had to face reality and go to Heidelberg for a week’s work. On Monday evening then I went together with a colleague to meet some friends that just had moved back to Heidelberg from India. We met for dinner at the ‘Bootshaus’ and were lucky enough to get a seat outside on their little terrace overlooking the banks of the Neckar river. 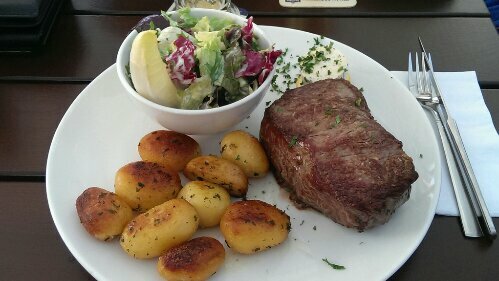 I had their ‘400gr Rumpsteak‘ which was fantastic. The meat was very lean but still had a very strong beef flavor and was nicely juicy. The charred crust of the steak was super crisp from the broiling and added a nice new texture to the humongous piece of meat. The kicker was their garlic/herbal butter that was extremely creamy and tasted heavenly together with the beef. The side salad was good but drowned in dressing and the roasted potatoes were perfect crisp on the outside and juicy on the inside. I loved this steak but I wished I had remembered that a German medium always tends a little more towards well done. I liked this place a lot as it was particularly nice on this scenic sunny afternoon sitting on their terrace, overlooking the river and enjoying great quality food served up by their very attentive and friendly waiters.